The beer buzz on the global beer circuit at the moment is all about cloudier, hazier and fruitier beers. This haze craze is really taking the US and UK by storm and so we bring you our own Foggy Juice New England IPA. Foggy Juice is a PROPER New England IPA brewed with yeast and lots of wheat, oats and carapils for body and creamy mouthfeel. The beer was double dry hopped, for maximum fresh hop flavour and aroma intensity! The result is big citrus, mango and peach tropical fruit flavours with subtle sweet malt profile. True to style, this is hazy, golden orange in colour with a soft and smooth mouthfeel and very low bitterness. 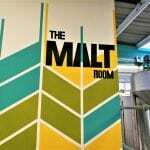 Malt – Pale Ale, Wheat, Oats, Carapils, Caramalt and Dextrose (sugar). Hops – El Dorado, Citra, Mosaic and Hull Melon.